Proper preventative care will reduce the risk of illness and will help you in achieving and maintaining excellent oral health so that you can look and feel your best. At May St Dental Centre, we know that prevention is always better than cure. Some people may wonder if their biannual dental checkup is necessary. The short answer is – yes! Your biannual appointments are your opportunity to let your dentist know of any discomfort you’ve been in or issues you suspect are present. We’ll take a detailed description of your medical-related history, and we recommend that you bring a list of medications you take in with you. Knowing your medical history will allow your dentist to gain an understanding of your overall health. There is a strong link between your oral health and other serious health concerns. For example, advanced gum disease is associated with pancreatic cancer, heart disease, diabetes and babies born with low birth weight to mothers with the disease. The warning signs that some dental conditions can be so subtle that only your dentist can identify them. At your visit, your dentist examines your mouth and checks for any signs of teeth decay. We’ll also evaluate you for the risk factors that are associated with illnesses such as periodontal disease and bone loss. This way, any potential problems can be recognised in the early stages, during which they are likely easily treatable. Your dentist will also check the way your bite comes together and may recommend X-rays or other diagnostic measures such as pictures. 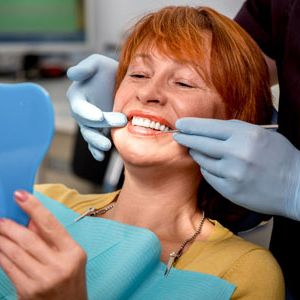 At each routine checkup, your teeth will be given a professional cleaning. Our dental team is meticulous about this gentle process, removing the areas of plaque that are tough to reach when you brush or floss. We’ll even give you advice on caring for your teeth at home and can give you tips on the proper techniques. A cleaning will leave your teeth gleaming and even removes surface stains so that you can show off a brighter smile. The maintenance checkup and cleans at our practice take about an hour, providing plenty of time to get to know you and make sure any concerns you may have are thoroughly addressed. Contact us today to book a same-day appointment for a checkup and clean East Fremantle!